BLACK BOX Jazz presents the acoustic jazz ensemble Rhythm Future Quartet at 4 p.m. on Sunday, November 5. 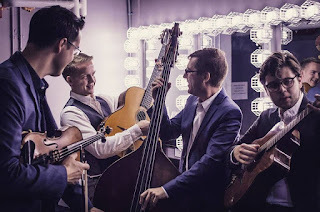 The virtuosic foursome, named for a Django Reinhardt tune, offers up a newly minted sound, influenced by the classic Hot Club of France, yet wholly contemporary. Led by violinist Jason Anick and guitarist Olli Soikkeli, the quartet performs dynamic and lyrical arrangements of both Gypsy jazz standards and original compositions that draw upon diverse international rhythms and musical idioms. With Max O’Rourke on second guitar and Greg Loughman on bass, Rhythm Future is dedicated to expanding the boundaries of a vital musical genre.